Writing can sometimes be a bit of a two edged sword, because it takes up quite a lot of my free time. I discovered a few years ago that ever since I started writing regularly, the amount of books that I read started to drop. I didn’t think of it immediately, but kept buying on books and putting them on my book case with the idea that I’ll get round to them. It came as quite a shock the day that I inspected my books and realized that there were quite a number there that I hadn’t read. So much in fact that I wouldn’t have to join the library for a full season. I got round to reading the ‘hype’ books (which is why I can get very worked up when I read bad fiction) and did catch up with a lot of my ‘one day I’ll read you’ books when I was in England thanks to public transport but this year, the amount of books that I’ve gotten round to reading is appalling. And, in a sense, it’s all writing’s fault because I find myself pushing more of my free time there than towards sitting down and enjoy other people’s fiction. 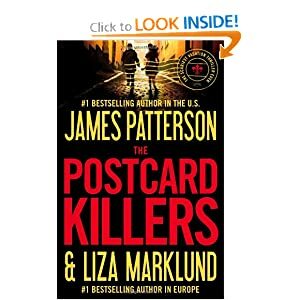 On impulse, I decided to by a cheapish audio book (The Postcard Killers by James Patterson and Liza Marklund) in order to establish whether or not I could utilize my time in the car more positively. It turned out to be one of the best decisions I’ve made. I loved listening to a book while I was driving. Yes, it was no substitute to reading, but it was much better than listening to fading radio stations or the same old songs over and over (and over) again as I drove hundreds of miles a day. And, I got to respect the stories that were out there. The book that I’m currently listening to was also a good choice. It has a lot of suspense, interesting characters and frighteningly detailed gore. Time and time again I found myself clutching the steering wheel, wondering what the hell I was doing in the car alone with these fictional people. It was a great experience and I believe that it’s made me a safer driver because quite suddenly I find myself savoring the drive, enjoying the story rather than putting petal to the metal in order to speed home. I was quite content to be stuck behind a truck because it meant I’d have more time listening to the book. So, I’ve started a new habit, one which I’m hoping will catch on with my other friend who also spends a lot of time on the road. Together then we could buy books and swap them back and forth because I feel that it’s the answer to the biggest frustration we’ve experienced so far (that our time spend behind the wheel is wasted time). If you drive a lot like I do, I can highly recommend the practice. Previous Article Enter the Dragon Part 7. Yay! I’m glad that you found something that makes your drive better. I’m going to start this when I’m walking home. It helps! My world’s changed and quite suddenly I have time to ‘read’ again. Jenn’s right about the drive home. I dunno about Patterson though lol. I’m admittably not fond of him either, but it was teh cheapest audio book and I wanted to see if I’d like it before I bought the more expensive ones. When i was a ‘road warrior’ i tried audio books a few times. Another good thing: i could usually find decent audio books(for free) at the local public library. We have a Listener’s Library here where I live but I’ve yet to find the shop. The website lied about their location. (glare).